Young Girl selected for prestigious Super 30 program. Young Girl to Speek 5 Languages and 9 Different Accents of English. With only 14 years old and an unusual intelligence, a little girl manages to express herself in 5 languages and 9 different accents of English. The most extraordinary about young Janhavi Panwar's skills is that she learned languages through the internet. As a consequence of her extraordinary abilities, she was selected to enter the prestigious Super 30 program when she was only 12 years. The process to enter the Super 30 program is very severe. Applicants must undergo stringent tests that will determine if they are ready to enter the program. Mr. Anand Kumar, the director of Super 30 met the linguist prodigy by meeting both at the Regional Public Officials Symposium held at the Haryana Institute of Public Administration (HIPA) in Gurgaon. Janhavi Panwar attended the event as an "inspirational speaker" and Mr. Kumar was invited as a "motivational speaker". Mr. Kumar was pleasantly surprised by Janhavi's linguistic qualities after hearing the girl's speech. He said, "The girl is a prodigy and will be admitted without having to take the admission exam". The Super 30 is designed to encourage talented low-income students to prepare for the Indian Institute of Technology (IIT) admission exam. Janhavi's linguistic talents were evident from her early childhood. By the time she was a little over a year old, she already mastered a vocabulary of approximately 550 words in English. Her father, Mr. Brijmohan Panwar, early identified the girl's extraordinary linguistic talents and encouraged her to develop her skills. Thus the little prodigy learned an extensive list of English denominations and listened to videos downloaded by her father. Mr. Panwar was fully committed to the task of stimulating Janhavi's cognitive and linguistic development. Within a short time, the girl demonstrated that her language skills allowed her to express herself in various accents of English. She learns accents by listening carefully to audios where English, Americans, Scots, and many other persons speak English using the language singularities of their regions. Her father knew that listening to videos would not be sufficient to fully develop the girl's talents. He, therefore, undertook the task of finding a linguist to aid assist the girl master the complex grammatical structures of language. The task was taken on by Professor Rekha Raj, a linguist based in Panipat. The commitment of the Panwar family for the development of the potentialities of the talented adolescent has filled them with joys and successes. At the age of 14, the prodigious Janhavi is polyglot and is fluent in English, French, Hindi, and Japanese. 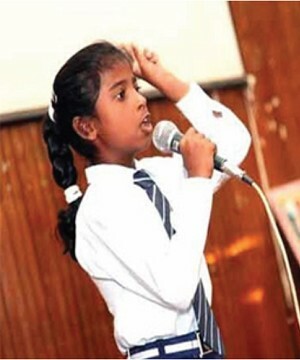 During her school years, Janhavi was always well above the academic standards of her age group. For this reason, her parents and teachers repeatedly requested special permission from the educational authorities for the girl to pass several courses simultaneously. As expected, the girl prodigy entered the career of Art at Delhi University at the age of 13. Mr. Panwar says he has always been proud of his daughter. "In the rural environment where we live, the baby is always expected to be male, but for us, the arrival of Janhavi was an extraordinary gift of life. Years later, life continues to reward the Panwar family. The achievements of the polyglot girl have made her an example to follow. She is frequently invited to give motivational lectures at various universities, institutions, and even IAS officials. 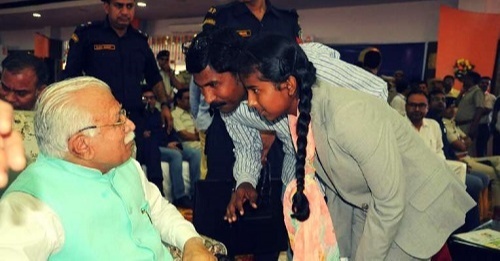 During one of her presentations, she met with the Chief Minister of Haryana, Mr. Manohar Lal Khattar, who praised the achievements of this brilliant young woman. Janhavi wants to explore different opportunities for her training and professional practice in the near future. She aspires to graduate as a social communicator and work as a professional who maintains permanent contact with people. The young polyglot hopes to enter the Indian Administrative Service (IAS) to educate herself and place herself at the service of her country. Joining the IAS is not an easy task. Applicants must pass the Civil Service examination before the Union Public Service Commission (UPSC). Each year more than one million people apply to the IAS, of which only 180 are admitted. This is equivalent to 0.01%. Janhavi Panwar possesses all the qualities required to be admitted to the Lal Bahadur Shastri National Academy of Administration where she will be able to train to reach the rank of IAS official. Janhavi Panwar is an exceptional example of the potential that emerges every day from the heart of Indian youth. The program such as the Super 30 favors the development of the skills of these young geniuses, who only require the support of the family, institutions, and society in general. In the words of Mr. Anand Kumar "don't offer us funds, provide a space where we can educate the students on the Super 30 program in the district of Gurgaon”. Click Here To Follow Her Youtube Channel and Learn 5 languages and 9 different accents of English.